2014 Immaculate Baseball will be the highlight of the week, maybe the month, possibly the year. Given that Panini's Immaculate Basketball started at $400 per box and currently sells upward of $459 today, 2014 Immaculate Baseball is a real bargain at $199.95 per box (my current price). Immaculate Baseball includes on-card autographs (2 per box based on early breaks by Panini) of Mike Trout, clayton Kershaw, Cal Ripken Jr, Frank Thomas, Ken Griffey Jr, Rickey Henderson, George Brett, Mariano Rivera, Chipper Jones, Nolan Ryan, Bo Jackson and more. Game Used Gear (4 per box from what I saw in early breaks by Panini) from all your favorite stars and all time greats such as Lou Gehrig, Shoeless Joe Jackson, Satchel Paige, Jackie Robinson, Ty Cobb, Honus Wagner, and Joe DiMaggio. Also included are rare Bat Knobs and Bat Nameplates. Click HERE to see the checklist for 2014 Immaculate Baseball. Given that each box has one base card (#d/99) or parallel (#d/10, #d/5 or 1/1), production is limited to only 11,500 boxes or less. Once collectors start busting boxes and see these amazing cards in their hands, expect demand and prices to go up. RESERVE your box TODAY at Sports Cards Plus before prices go up. You don't have to wait until Immaculate Baseball arrives Wednesday to pull something amazing. Sports Cards Plus has all your favorite products from 1990 to the present. We have restocks arriving daily. Pick your box from The BEST CASES in The Hobby at LOW, LOW, LOW Prices. David knows well The Legend of The Super Hit Factory. He buys all his boxes at Sports Cards Plus. Here is David with his 2014 Topps Finest Baseball Stephen Strasburg SUPERFRACTOR 1/1. Brad came in for 2014 Topps Finest Baseball. 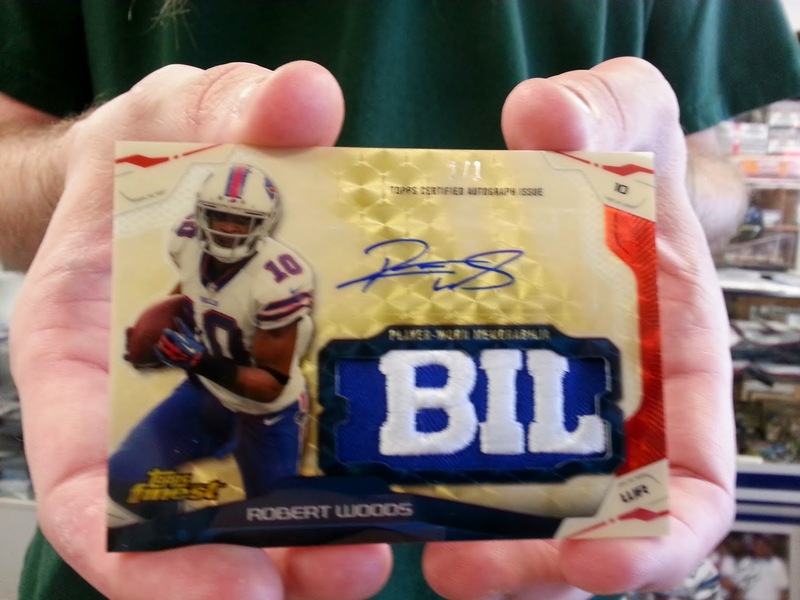 Here is Brad with his Robert Woods Auto Bills Logo Patch SUPERFRACTOR 1/1. David came in to try his luck in of $100.00 2013-14 Preferred Basketball Best Pull Contest. Here is David with his Steve Nash Auto Patch Silhouette #d/25 (listed in Beckett for $500.00). David's pull ties Tommy's Kyrie Irving Auto Patch Silhouette #d/25 (listed in Beckett for $500.00). We only have 14 boxes of Preferred left before we declare a winner. Come on in and give it a try. Marcus loves 2012 Topps Valor for ONLY $129.99 per box at the Super Hit Factory. Marcus already pulled two Andrew Luck Auto RCs #d/50 from Topps Valor but he didn't have a Topps Valor Robert Griffin III Auto RC. He asked me to pick a box of 2012 Topps Valor with and RG3. Here it is! You know Nate. Nate has pulled over 40 Michael Jordan Autographs at The Super Hit Factory. On this visit, Nate didn't pull a Jordan Auto but he wasn't disappointed with this 2012-13 Upper Deck All-Time Greats Basketball Lebron James Auto 1/1. What are you waiting for? Don't be the guy who says, "That could have been my picture." Come to Sports Cards Plus TODAY and pick your box from The BEST CASES in The Hobby at LOW, LOW, LOW Prices.